Another issue of an occasional series—Dear Adrian—in which I answer questions about event design, elementary particle physics, solar hot water systems, facilitation, and anything else I might conceivably know something about. If you have a question you’d like me to answer, please contact me (don’t worry, I won’t publish anything without your permission). I have just read through The Power of Participation over one year after I received a signed copy from you! In short, I have a question about The Three Questions. I understand the process both in singular and multiple form (combined with round tables). From my reading, The Three Questions appears to take some time (based on the amount of participants) with only one person speaking. This appears at odds with the aim to get people engaged in conversation. I would also think – not a question just an observation – that group of 6 would be better. This would speed up the set piece of one person speaking and others listening, reduce the need for breaks and keep the energy going early in the day. Can you clarify my understanding of The Three Questions? Steve, I like your question because it highlights a key tension inherent in group process design: the tension between intimacy (going deep with a few) and discovery (uncovering the possibilities of the many). Let’s explore this in more detail. have each had an opportunity to share our own expertise and experience (#3). Because each person gets the same amount of time to share their answers to The Three Questions to a group, the time needed to run the process is proportional to the group’s size. [I’m neglecting here the few minutes needed to a) explain the process and b) provide one or two short breaks for large groups.] In practice, I’ve found this restricts the maximum effective size of a single group using The Three Questions to 60 people. If more than 60 people are present, you divide them into smaller groups and run multiple simultaneous The Three Questions sessions. Even if we have 60 people or less, we may still decide to divide our group into several smaller groups and run multiple simultaneous sessions. Typically we’ll do this when time is a constraint. For example, next month I’m leading a two-hour, ~200 person, participation techniques workshop. In order to cover multiple core techniques in two hours with this many participants, I will give them just a taste of The Three Questions by running 30+ concurrent 6-person groups. Everyone will know five former strangers much better after the ~20 minute session is over, but they won’t have learned more about the others in the room. So when designing a session or conference that includes The Three Questions, there is a trade-off between the time we have or want to allocate and group size, because we need to give each person sufficient time for meaningful sharing with their group (typically 1 – 2 minutes per person). There’s no single answer for this design decision that’s optimum for all circumstances. At a multi-day conference, for example, it makes sense to run multiple simultaneous 50-60 person Three Questions groups for a couple of hours at the start of the event. Everyone in each group will learn important information about the interests and resources of their 50-60 peers. For a monthly board meeting, once a year I might run a single session with the ten board members to remind the group of each member’s “why?”. And at a one-day peer conference with ninety participants, perhaps three simultaneous 30-person sessions would be the way to go. The wider you spread it, the thinner it gets. discovery — learning important things (interests and resources) about everyone in a large group, in a process that feels more like structured sharing. Both intimacy and discovery have their benefits. By choosing the size of the groups using The Three Questions, it’s possible to select the balance that works for the design and constraints of each unique situation. are printed on a large card given to each person. I explain that they cannot answer these questions incorrectly, share some examples of answers, allow participants few minutes to answer them in writing on their card, and then give everyone in turn the same amount of time to share their answers with the group. You can run The Three Questions in small groups, or with as many as 60 people in a roundtable. For large groups it’s important to break up the sharing every 20 minutes. Run activities at each break that help group members learn more about the group. 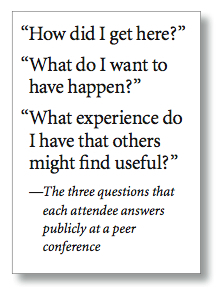 The Three Questions make a clean break with the convention that at conferences most people listen and few speak. They publicly uncover a rich stew of ideas, themes, desires, and questions that is bubbling in peoples’ minds. And they expose the collective resources of the group—the expertise and experience that may be brought to bear on the concerns and issues that have been expressed. The Solution Room is an opening conference session, typically lasting between 90 and 120 minutes. It both engages and connects participants and provides peer-supported advice on their most pressing challenges. By facilitating peer interaction and consultation at the start of an event, The Solution Room creates a conference environment that embodies participation, peer learning, and targeted problem solving. By the end of the session, every participant has had the opportunity to receive advice and support on a challenge of their choosing. 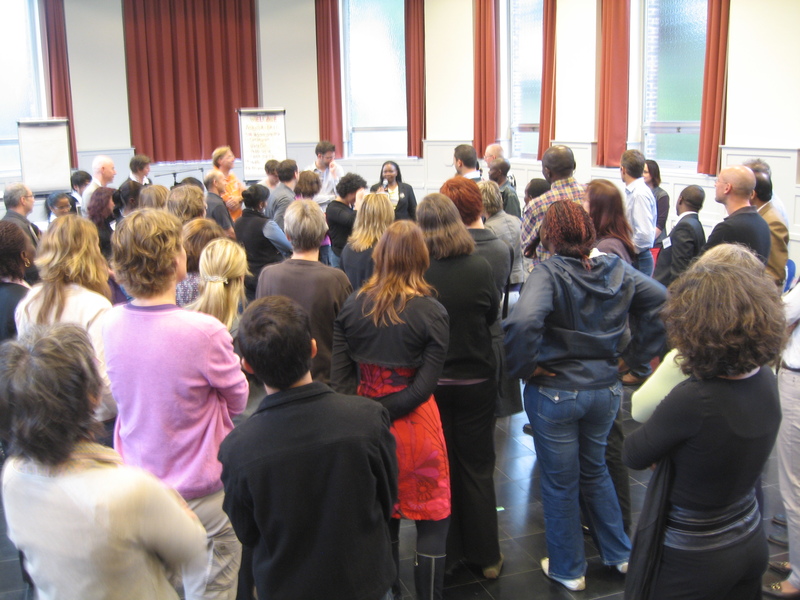 A session of 20 or more people starts with a short introduction, followed by a human spectrogram that demonstrates the amount of experience available in the room. Next, we give participants some time to think of a challenge for which they would like peer advice. A second human spectrogram follows which maps participants’ comfort level. Participants are then divided into small equally-sized groups of between six and eight people. 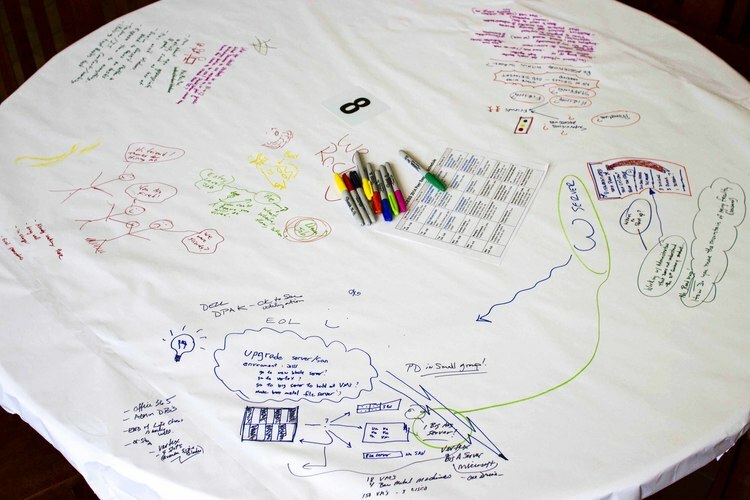 Each group shares a round table covered with flip chart paper and plenty of colored markers. Group members then individually describe their challenge on the paper in front of them using mindmapping. Each participant gets equal time to explain their issue and receive advice and support from their table peers. When sharing is complete, two final human spectrograms close the session. They provide a public group evaluation that maps the shift in comfort level of all the participants and the likelihood that participants will work to change what they’ve just shared. Both of these techniques allow people to learn about each other and connect around issues that are personally/professionally meaningful. In my experience, they lead to much more powerful and authentic participant engagement than the generic “icebreakers” (hate that term!) typically used. Connections with people are formed by our experience with them over time. (Yes, Buddhists and Taoists, the present moment is our only reality, but we still experience it through the filters of the history and desires in our brains.) Besides learning about people we’re with though our direct experience, we discover more by listening to their descriptions of their past and present experiences and their hopes for the future. As people, one by one, answer these questions they share their past, present, and future with everyone in attendance. 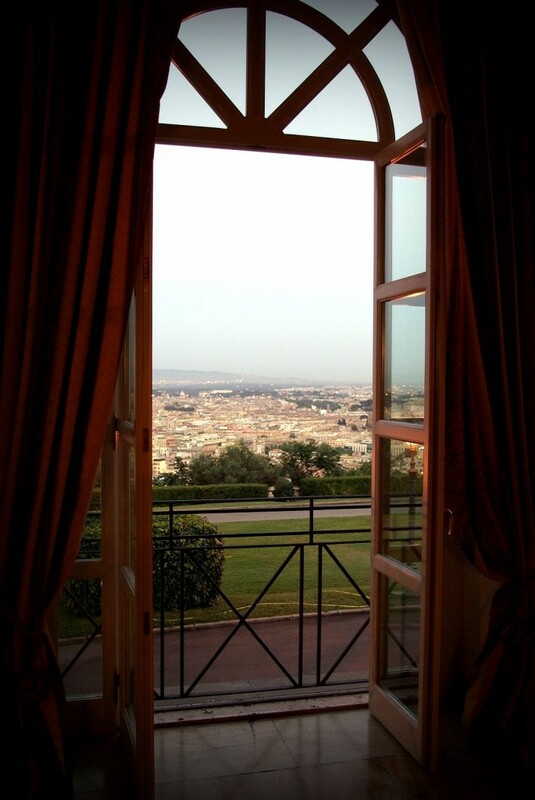 Each person opens a window through which the time line of their life can be seen more clearly. This sharing provides the foundation for connections to be deepened during the conference that follows. When I was a graduate student I used to dislike going to academic conferences. Despite having won a senior scholarship to Oxford University I was scared of walking into a room of people I didn’t know and trying to start up conversations. When I sat next to random folks at lunch and we talked, I always had the sneaking suspicion that there were probably other people present at the conference whose company I’d enjoy even more—but I had no way to figure out who they might be. We are curious about other people, especially if we know that we share a common interest. And every culture has its own conventions for meeting and learning about strangers. Unfortunately, in a conference setting these conventions limit the number of people we can meet. For example, in my experience even an extreme extrovert will find it difficult to meet a majority of the people at a 100-attendee two-day conference. So in the 80’s, when I began to have opportunities to design my own conference formats, I knew that I wanted to include the opportunity for participants to learn about each other, right at the beginning of the event. Over the years, this desire shaped the first Conferences That Work session: the roundtable. The core of every roundtable is the time when each attendee in turn answers the following three questions to a large group (usually, everyone else who is attending the conference). How these questions are explained to attendees is described in detail in my book. There are no wrong answers to the three questions, and attendees can answer them by publicly sharing as little or as much as they wish. What I find wonderful about roundtable sharing is how the atmosphere invariably changes as people speak; from a subdued nervousness about talking in front of strangers to an intimacy that grows as people start to hear about topics that engage them, discover kindred spirits, and learn of unique experiences and expertise available from their peers. When sharing is over, both a sense of comfort and excitement prevail: comfort arising from the knowledge attendees have of their commonalities with others, and excitement at the thought that they now have the rest of the conference to explore the connections and possibilities that the roundtable has introduced. Switching the responsibility for initial introductions from attendees to the conference model bypasses normal social conventions – replacing them with a safe place for people to share about themselves to others. This simple conference process gives attendees the openings they need to further satisfy their curiosity about their peers. It works amazingly well.